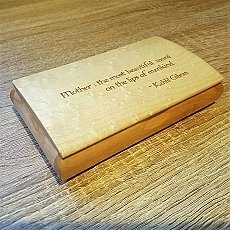 "Mother: the most beautiful word.."
Jan 24, 2019 1/27-2/1 Silver Bonsai's sweet little Blue Water Grill location will be temporarily closed from Sunday Jan. 27th - Friday Feb. 1st..
Dec 19, 2018 Donation Opportunity Donate towards Silver Bonsai's Flood renovation and receive a variety of thankyou gifts in return, Together we are better. Thankyou all for your support across the years . We are looking forward to another 20 years and more! Oct 17, 2018 Hurricane Michael Hurricane Florence missed us, but Hurricane Michael did not. The gallery is temporarily closed for renovations, but our website is ready for orders! Inspired by asian architecture and zen gardens this unique collection is striking. © 1997 - 2019 Silver Bonsai Gallery. All rights reserved.